New York - On Sunday, April 17, 2005, Lidia Krushelnytsky, founder and director of the Ukrainian Stage Ensemble, will be honored at a celebratory luncheon (12-2:30) at the Pierre Hotel. 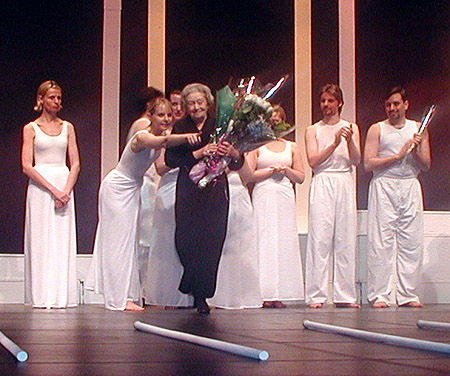 On the initiative of the Friends of the Ukrainian Stage Ensemble and under the sponsorship of the Self Reliance (NY) Federal Credit Union, longstanding supporter of the Stage Ensemble, Lidia Krushelnytsky's students and the general public will salute her at this gala event marking the occasion of her 90th birthday and her Ensemble's 40th year. Among the dignitaries expected to attend will be Dr. Valerij Hajdabura, historian of the Ukrainian diasporan theatre and artistic director of the Ivan Franko Theatre in Kyiv, who will congratulate Lidia Krushelnytsky on her life's work on behalf of the Society of Theatre Artists of Ukraine. Lidia Krushelnytsky, drama teacher, former actress with the Hirniak Studio-Theatre in New York and director of the New York-based Ukrainian Stage Ensemble has produced over 150 plays, dramatic readings and other performances over the last four decades, touching the lives of 247 students, many of whom are still members performing with the ensemble. The Ukrainian Stage Ensemble's repertoire has included the classics of Ukrainian, as well as world, literature: from Ivan Franko and Lesia Ukrainka, to Eugene Scribe and Carlo Goldoni. Bringing together amateur and professional talent, Lidia Krushelnytsky's Stage Ensemble brought high theatre art to Ukrainian audiences across North America. Among her credits are: Lesia Ukrainka's The Forest Song (1970, 1996), Eugene Scribe's A Glass of Water (1977) translated by G. Shevelov; V. Vynnychenko's The Black Panther (1980); Goldoni's Servant of Two Masters (1986) translated by O. Varavva; I. Kocherha's Yaroslav the Wise (1988); M. Kulish "Sonata Pathetique" (1992). In 1991, Lidia Krushelnytsky took the Stage Ensemble on an extended tour of her native Ukraine, where its performances were met with critical and popular acclaim. In 2002, when the Ukrainian Stage Ensemble returned to participate in the First International Diasporan Theatre Festival in Kyiv, Lidia Krushelnytsky was honored by presidential decree for her significant contributions to Ukrainian culture and art. To reserve a seat for the luncheon, mail $125 (check payable to "Ukrainian Stage Ensemble) c/o Marta Kebalo 143-20 84th Avenue, Briarwood, NY 11435. All proceeds and donations will go to support of the theatrical productions planned to mark the Ukrainian Stage Ensemble's 40th Anniversary year.